Figure 5-17.-Flotation collar installed on forest penetrator. The flotation collar is made of bright orange foam rubber for high visibility and weighs about 1 1/2 pounds. (See figure 5-17.) It is 2 1/4 inches long, with a 7 3/4-inch diameter at the top and a 4-inch diameter at the bottom. 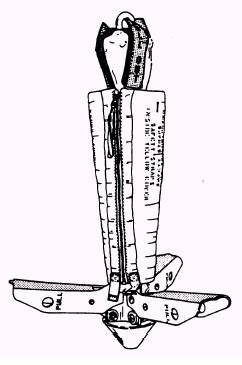 When the flotation collar is installed on the forest penetrator, the retracted diameter at the penetrator is 9 inches. The forest penetrator and flotation collar are intended to assist the rescue swimmer to perform rescue operations in the water or to rescue survivors on land. The flotation collar is a device that, when fastened around the forest penetrator, allows flotation of the complete assembly during air-sea rescue operations. During land rescue operations, the forest penetrator is lowered to the survivor with the seats retracted. For sea operations the forest penetrator is lowered to the rescue swimmer and survivor with the flotation collar installed, safety straps hanging free, and the seats retracted. In this configuration, the penetrator will float its top about 6 inches above the surface of the water. The forest penetrator is designed to accommodate one, two, or three survivors at the same time. The aircrewman's responsibility for maintenance of the forest penetrator is limited to washing with fresh water. Repairs or other actions are performed by organizational-level maintenance or above. All forest penetrators receive a calendar inspection upon issue and at intervals not to exceed 225 days. The calendar inspection consists of visually inspecting both the forest penetrator and flotation collar. 1. All fabrics for cuts, tears, deterioration, and abrasion. 2. Seams for proper stitching. 3. Straps for security of attachment and wear. 4. Any other parts for wear, damage, and security of attachment. 5. All hardware for security of attachment, corrosion, damage, wear, and, if applicable, ease of operation. 6. The cover for strains, dirt, and general condition. 7. The slide fastener for damage, corrosion, and ease of operation. 8. Compare markings on the forest penetrator and flotation collar to markings listed on the applicable tables in NAVAIR 13-1-6.5. Restore any faded markings, and correct markings, if necessary, with indelible ink. 1. Wash the penetrator and collar with a mild soap and water solution. Rinse well with fresh water. 2. Wipe the penetrator and collar with clean, lint-free cloth and allow to dry. 3. If necessary, apply silicone lubricant to slide fasteners on the cover of the penetrator to ensure ease of operation. 4. Apply a lubricating oil to all pivot points of the penetrator. Wipe off excessive lubricating oil. 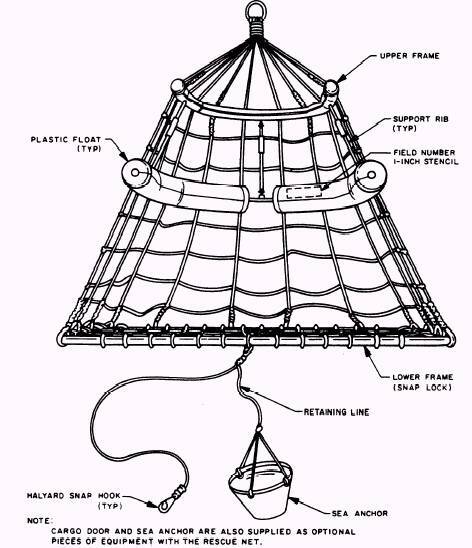 Figure 5-18.-Rescue net, parts nomenclature. The rescue net is used to assist the rescue swimmer performing rescue work from a helicopter over water or land. The rescue net may also be used to ferry or pick up cargo. THE SEA ANCHOR MUST NOT BE USED WHEN HOISTING PERSONNEL OUT OF THE WATER. The aircrewman's responsibility for maintenance of the rescue net is limited to a freshwater wash after use. Repairs or other actions required are performed by organizational-level maintenance or above. 1. Erect the net by unfolding its lower frame assembly and forcing the assembly down. The frame will snap open. 2. Suspend the open section of the net and slide sleeves or the upper support ribs between the swivel joints. The sleeves rest on the support rib stops. 3. Inspect all hardware for security of attachment, corrosion, damage, wear, and ease of operation. 1. Wash the rescue net with a mild soap and water solution. Rinse well with fresh water. 2. Allow the net to air dry.